"This recipe is very simple to make, and you can substitute crab or shrimp for the lobster. I use all three when we are craving seafood. Serve over rice or pasta." Melt the butter in a medium saucepan over medium heat. Slowly cook and stir mushrooms in the butter until tender. Mix in lobster meat. Cook until opaque. Remove mushrooms and lobster from saucepan and set aside. Reduce heat to low. Place flour in pan. Cook and stir approximately 2 minutes, then stir in chicken broth, heavy cream and pepper. Simmer 5 to 10 minutes, or until thickened. 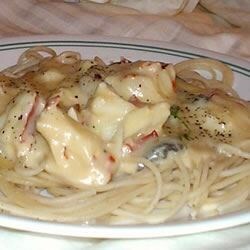 Stir mushrooms, lobster and Parmesan cheese into the sauce mixture. Continue cooking 5 minutes. Watch how to make this quick seafood soup. I was the only one our 6 who ate this and I only ate it because I made it. The sauce was bland. Absolutely decadent, wonderful and rich! I added garlic and crushed red pepper to the sautee'ing process. I used 1/2 and 1/2 in place of heavy cream. YUM!!!!!!!!!!!!!!!!!!!!!!!!!!!!!!!!!!!! delish!! velvety taste, restaurant quality.. I did add minced garlic and a little more heavy cream to make more sauce. soooo good!